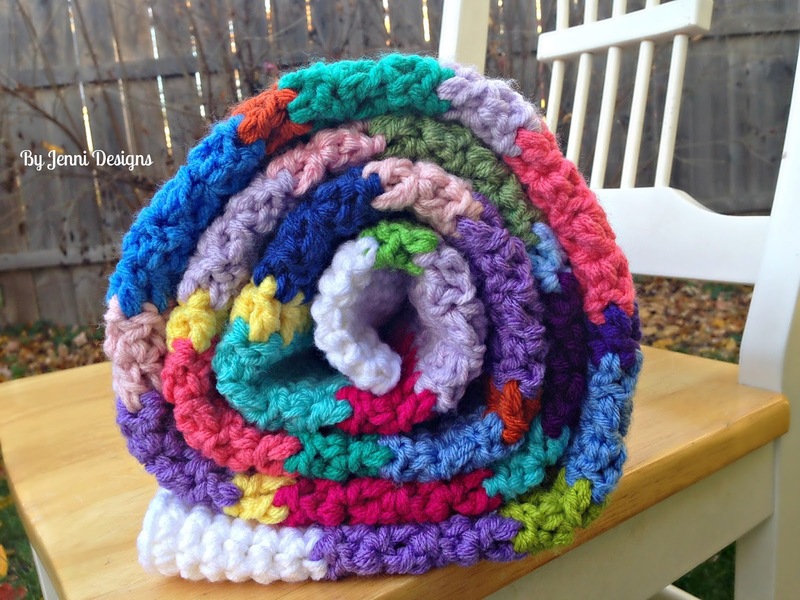 My yarn stash has grown out of control and I've been trying to make good use of all the extra yarn from past projects so today I am sharing with you one of the easiest ways I have found to use up lots of yarn! 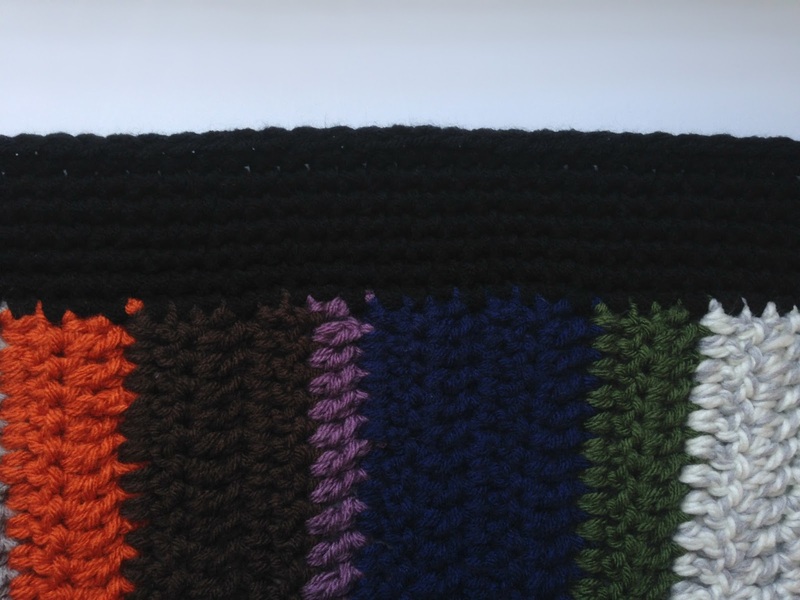 This pattern calls for holding two strands of worsted weight yarn together (you can also use bulky 6 yarn) to create a thicker yarn. I have used a mix of all sorts of brands, if you are interested in the exact brands and colors I used for both of my example blankets scroll down below the pattern for a detailed list. Finished size: Approx. 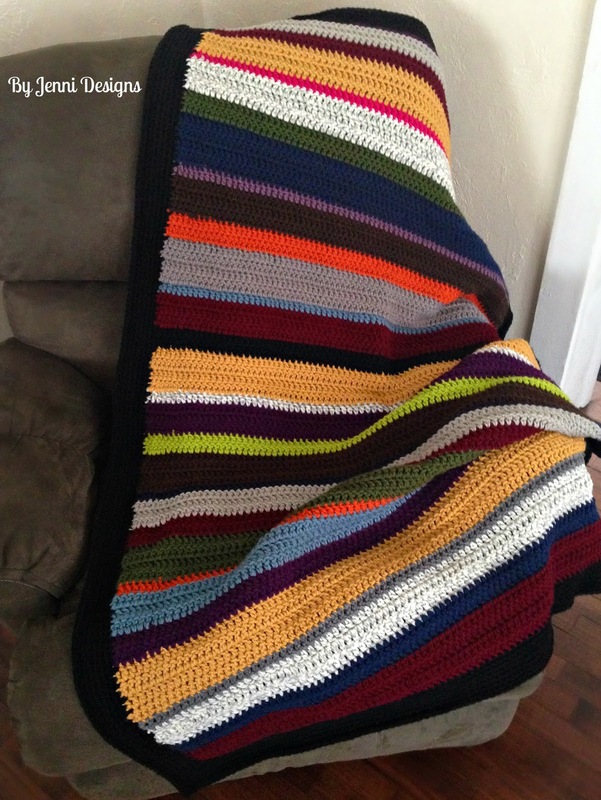 60" x 45"
additional rows to the end of the blanket if you do this. -Each row will use approx. 38 yards total, 19 yards per strand. 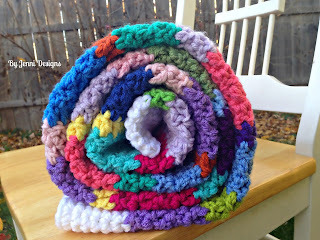 -Your border will use a lot of yarn, approx. 700 yards total. 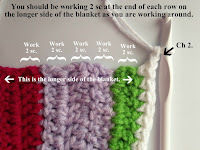 -Your first stitch of each row will always be worked in the same space as the ch 1. -Sew in your ends as you go, you'll thank yourself later if you do this. 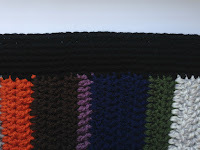 7 rows & 13 stitches = 5"
Row 1: Ch 94, dc in 3rd ch from hook and in each ch across. Row 2-4: Ch 1, turn. Dc in each across. Fasten off and join new color with a sl st.
Row 5-6: Ch 1, turn. Dc in each across. Row 7-9: Ch 1, turn. Dc in each across. Row 10: Row 5-6: Ch 1, turn. Dc in each across. Row 11-14: Ch 1, turn. Dc in each across. Row 15-16: Ch 1, turn. Dc in each across. Row 17-19: Ch 1, turn. Dc in each across. 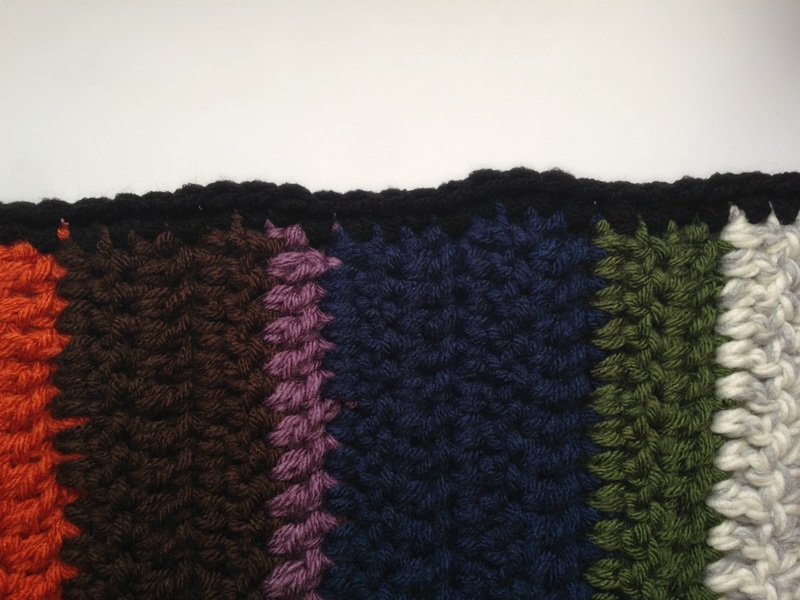 Row 20: Row 5-6: Ch 1, turn. Dc in each across. Continue to repeat rows 11-20 until you reach 80 rows total. Fasten off and if you didn't sew in your ends as you went, do so now. 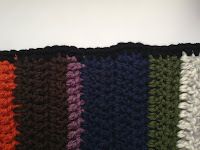 Row 1: Ch 1, sc around the edge of the blanket, ch 2 at each corner. Join. You should have approx. 160 sc down the long sides of the blanket. If you are a few off, that's ok but you don't want much more than 160. If your edge is not perfectly straight after your first few rows don't worry, it should straighten out by the time you complete all 7 rows. 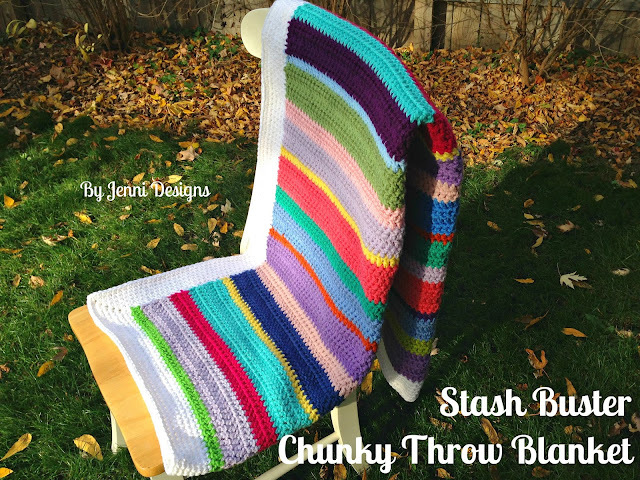 Below is my fall colors throw after row 1 & then again after row 7. Row 2-7: Ch 1, sc in each around, when you reach each corner space work all of the following into the corner: [sc, ch 2, sc]. Join. 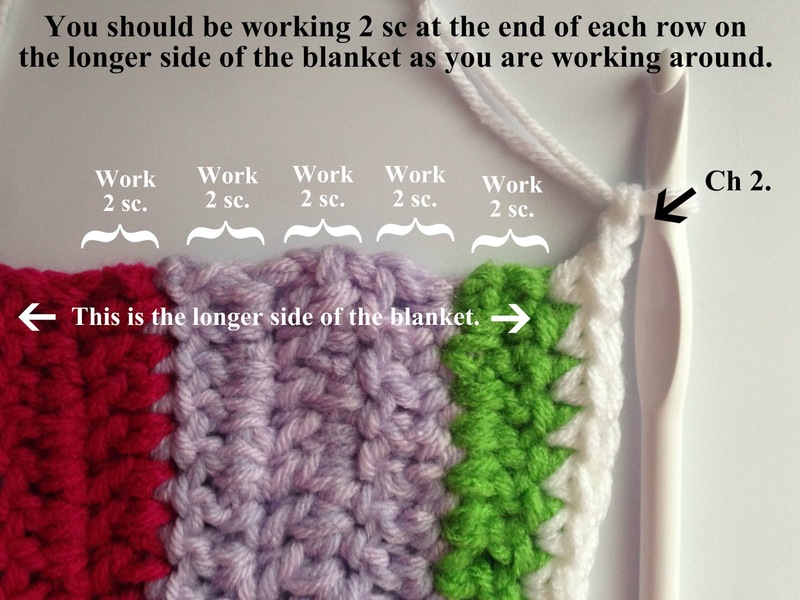 Fasten off after row 7 and sew in ends. 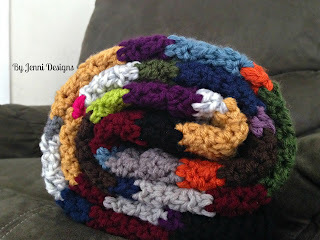 For this blanket I tried a few rows with a bulky 6 yarn and it worked up great next tp the two strands of worsted weight yarn. LOVE YOUR PATTERNS!!! Thank you so very much for sharing!!!! !